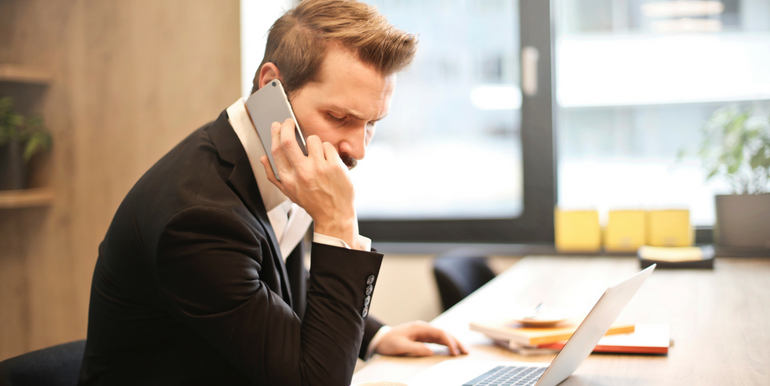 Being prepared for difficult phone interview questions is the difference between getting to the next round in the interview process, (generally an in-person interview), and not receiving a callback at all. While you can never know exactly what the interviewer is going to ask you beforehand, you can prepare for the most common questions and use several tactics to navigate even the toughest phone interview questions. Just because it’s a phone interview doesn’t mean that you shouldn’t take it seriously. By acting like it’s a formal face-to-face interview, you can ensure your brain is in business mode. Start by dressing the part as you would for a traditional interview - if this means dressing up to look and feel the part, do so. Next, find a quiet room away from any noise or people. A tranquil, calm place will put you at ease and make you less conscious about what you say on the phone. Finally, make sure that this area has a comfortable seat and a desk. While you may prefer to walk around the room as you talk, you'll be able to gather your thoughts better if you sit up straight and speak with the same confidence and expertise you would if you were facing your interviewer. Make sure to have a pen and paper to jot down any interesting notes or questions that come up that you want to cover at the end of the conversation. The ability to have prepared notes in front of you is one of the best things about phone interviews, so take advantage of the opportunity! Think about the job interview questions the interviewer will be most likely to ask. They will typically be about yourself, your skills, your employment history, career goals and your qualifications for the job you are applying. Write down answers to these questions in bullet points as a reference guide so they don’t come across as staged. It is also worthwhile jotting down facts and figures about the industry that you can drop into the conversation when appropriate. Lastly, always have a printed copy of your resume so you can reference when speaking about your background and previous work, education, and volunteer experiences. Quickly rattling off an answer can be tempting when asked a tricky interview question. However, to a recruiter, it’s a sign that you might be ill-prepared. Instead, make sure to compose yourself and take the time to consider their questions before replying. If you need to buy time, start by repeating the question for clarity and asking for a moment to think. The interviewer won’t mark you down for this. If anything, they will be more impressed with your control and your desire to answer thoughtfully. When you do reply, make sure to speak clearly and slowly. Try to come across as personable and enthusiastic, too. Remember, the interviewer can’t see your smile or body language, so you will need to vary your speech to achieve emphasis. For practice, begin to say something with and without a smile on your face. The enthusiasm a candidate exudes over the phone is palpable when a person has a smile on and vibrant energy surrounding them. If you’re still looking for that perfect role, Sparks Group can help. We work with candidates to truly understand their needs and goals to match them with a job that fits their skills and experience. Sparks Group maintains close relationships with top companies who are looking to fill IT, finance, creative and administrative roles and more. Get started today by browsing our job board for a list of available full-time, temporary and contract-to-hire opportunities.